A pair of bystanders broke a toddler’s fall after he fell from the third-floor fire escape of an apartment building, officials said. Rana Novini reports. A pair of bystanders broke a toddler’s fall after he fell from the third-floor fire escape of an apartment building, officials said. The 2-year-old boy got out onto the fourth-floor fire escape at an apartment building on 49th Street, near 47th Avenue, in Sunnyside, Queens, around 6 p.m. on Saturday, police and the FDNY said. The toddler fell from the fourth-floor fire escape to the third-floor escape, where he was dangling, before falling from the third-floor escape, police said. 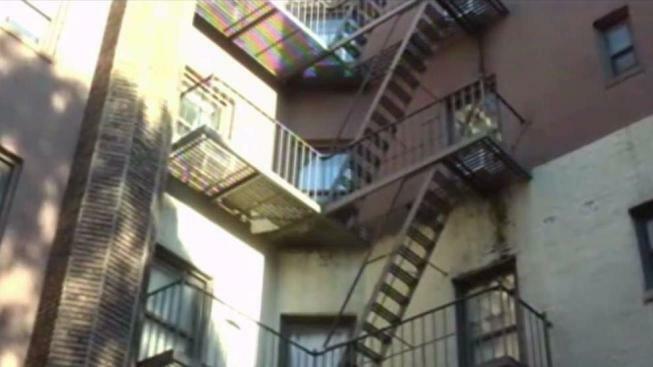 Two women standing below the fire escape were able to break the toddler’s fall, the NYPD said. The toddler was taken to the hospital without any serious injuries, according to police. One of the women was taken to the hospital with bruises on her arm, witnesses said. Police said the boy’s mother was inside the apartment when he fell. No one had been arrested as of Saturday evening.